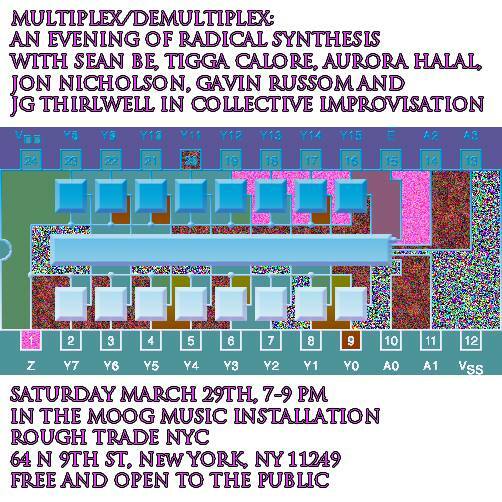 On March 29 2014, JG Thirlwell will take part in Multiplex/DeMultiplex : An Evening of Radical Synthesis. 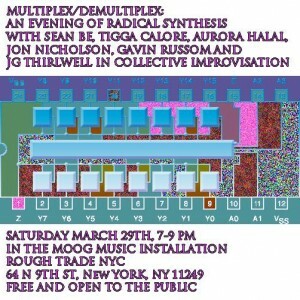 The evening, curated by Gavin Russom, will feature with artists engaged in a collective improvisation on Moog electronic instruments. The participants are Sean Be, Tigga Calore, Aurora Halal, Jon Nicholson, Gavin Russom and JG Thirlwell. The event will take place in the Moog Music Installation at Rough Trade NYC, 64 N 9th street Brooklyn NY 11249. It runs from 7pm to 9pm and is free and open to the public.